The Very Revd Jeremy Winston, Dean of Newport Cathedral, who died after only a few weeks in office, was an “outstanding individual” who “still had so much left to do”. The Bishop of Swansea and Brecon, the Rt Revd John Davies, paid tribute to Fr Jeremy’s deep faith, hospitality and humour in his address to seven hundred hushed mourners who packed into Newport Cathedral today for a Requiem funeral service. As Fr Jeremy had requested, “The Sparrow’s Prayer”, written by Lord Hailsham, formed part of the address, words which look forward in hope and faith to a glorious life beyond death. Fr Jeremy became ill shortly after he was installed as Dean in September this year. He died last week just as he was due to begin treatment for a brain tumour. He was 57. The Archbishop of Canterbury, the Most Revd Dr Rowan Williams, sent a personal letter to the Cathedral expressing his own shock and grief. The Bishop of Monmouth, the Rt Revd Dominic Walker OGS, presided at the Requiem Mass which was also relayed to three hundred people gathered in St Mary’s Priory Church, Abergavenny, where Fr Jeremy was Vicar for eighteen years. The Archbishop of Wales, the Most Revd Dr Barry Morgan, was one of seven bishops among the mourners. Civic dignitaries included the Mayor of Newport, the Chairman of Monmouthshire County Council, the High Sheriff of Gwent, the Lord Lieutenant for Gwent, and Lord Rowe-Beddoe of the Representative Body of the Church in Wales. After the Commendation, the Cathedral Choir sang ‘The Souls of the Righteous’, a piece composed by Cathedral Organist, Christopher Barton, in memory of Dean Jeremy. Then, more than a hundred clergy and lay ministers from around Wales lined the path from the west door of Newport Cathedral as Fr Jeremy’s coffin was carried out to the waiting hearse. The coffin was taken to lie overnight in St Mary’s Priory Church, Abergavenny, which will remain open into the evening for local people to pay their last respects. Fr Jeremy will be buried at a private service tomorrow, Thursday 1st December. There will be a Service of Thanksgiving for the life of Fr Jeremy at St Mary’s Priory Church, Abergavenny, on Saturday 21 January at 11.30am. None of us would have wished to be here today, but all of us had to be here. So, thank you for coming. Then, just as the BBC says ‘In this report there is some flash photography’, I should say that in this address there’s some very gentle bad language! Jeremy Winston – Father Jeremy to so many, Dean Jeremy for such a cruelly short time, ‘The Winston’ to some of us, Uncle Jeremy to others, but today simply Jeremy – was an outstanding individual in so many ways. He was one of the best friends and colleagues for which anyone could wish, and there is so much in his life that we prize. I will give only a little glimpse of that today – but lest you think I short-change him – let me remind you that an opportunity for a fuller appreciation of Jeremy’s life will come with a Thanksgiving Service at Abergavenny in the New Year. I am asked to preach about faith in Jesus, the Risen Jesus, who underpins our religion; and in a little while I’ll do as I’m told. But I hope that you will understand me (and forgive me, if you need to) if I begin with humour. It was such an important feature of Jeremy’s life. I can picture him now, at the recent Governing Body of the Church in Wales which he chaired a matter of days before the diagnosis of his illness, clasping his hands together and rocking with laughter as he so often did – not, (your Grace) during the Presidential Address, certainly not (Lord Rowe Beddoe) during the Representative Body report on Membership and Finance! It was over lunch. I can’t remember whether he had taken the mickey out of me or, I out of him – it doesn’t matter. So many have said and in so many different ways (and we agree) that Jeremy was – and this list is not exhaustive – unfailingly courteous (even to those with whom he disagreed) visionary, profound, inspirational, wise, multi-talented, cultured, hard-working and intelligent leader who could and did both move and motivate others. We agree, of course. But we also agree that he did love to laugh. Crisp and gently wicked one-liners, often delivered with narrowed eyes and curled lips, were part of Jeremy’s stock-in-trade. And, even when they came from others in his direction, he much enjoyed them. · “Are you a miserable old git?”; (answers on a postcard, please. My family are disqualified from participating). It was in the second of these that I found something which I think is appropriate to the sad circumstances which bring us together. It will be known to some of you, no doubt, and in a variety of forms. But this is, apparently, the original, taken from, quote, ‘the obituary columns of a Cardiff Newspaper’. I won’t use the name of the deceased, although the book does publish it. Today we, I guess, are not so much annoyed but devastated. Devastated at a life cut short so swiftly, so aggressively and (without denying so many things already achieved) so wastefully. That said, we have to be realistic and draw some comfort from the likelihood that death has spared Jeremy lengthy and challenging treatment, the outcome of which could well have been profoundly disappointing. And (perhaps selfishly) we can think of ourselves being spared seeing our friend but a shadow of what he was. Even so, and although he had done so much, there was still so much left to do, not least in this Cathedral, and I imagine that he’s bloody annoyed that he’s not going to be here to do it. The suggestion was that the life of a man is the known, short space of fair weather – the time when the sparrow is in the safety of the room. But of what lies beyond, when the sparrow flies out, there is ignorance. And the advisers conclude that, if this new Christian religion could help their understanding, if this Christian God the Father, in Jesus Christ, shines light into the ‘short space’ of present flight, the King should go for it. Which he did. Secondly, and more familiarly, Hailsham draws upon chapter 10 of the Gospel according to St Matthew where Jesus seeks to encourage his endangered disciples in the face of the challenges and chances which they will face. Hear this, Thy weary sparrow when he calls. Mercy, not justice, still his constant plea. So shall Thy sparrow, crumpled wings restored. Soar like a lark, and glorify his Lord. Hailsham looks in hope and faith beyond being a broken sparrow to becoming a glorious and melodious lark, soaring on high, singing in faith and joy of the love of God. The faith which King Edwin decided was a bit more hopeful than anything to which he’d previously subscribed, the faith which led Lord Hailsham to write his sparrow’s prayer, is a wonderful gift, and a treasure which the earthen vessel of the church is called to proclaim afresh in every generation. It’s no fairy tale, trouble-free faith which hides us from the dark things of life and death, and pretends that they’re not there. Rather, it enables us to journey and deal with things like thanks and sorrow, anticipation and anger. It enables us today to grieve, but not without hope. That faith underpins this service. It motivated everything that Jeremy did. It’s a living, loving faith in a living, loving Jesus whose friends thought the game was up when the events of Calvary unfolded with, to return to Bede, the sparrow gone into the dark winter. But we are here because of what followed. That crumpled sparrow becomes Hailsham’s soaring lark. The broken Christ became the Living Lord and nothing was going to stop his friends talking about it. It’s their experience, their witness that enables us today to let real light shine into Jeremy’s ‘short space’ and into today which, without it, would otherwise be simply a memorial meeting, remembering a friend and colleague, with no future. I want to end with just a few more quotations which, I hope, are appropriate. First words written by Jeremy himself which were sung in this Cathedral at his installation on September 10th, and which, if I’ve understood them correctly, move us from desolation to new life. When the day that he must go hence was come, many accompanied him to the riverside; into which as he went he said, “Death, where is thy sting?” And as he went down deeper, he said, “Grave, where is thy victory?” So he passed over; and all the trumpets sounded for him on the other side. But thirdly and finally, remembering something of Jeremy which I’ve not yet mentioned, the pleasure which he took in hospitality, in cooking and in dining, let me return to humour and to the second book of the trinity to which I referred earlier, “Wrinklies’ Wit and Wisdom”. The wisdom of Rowan Williams is often quoted here and elsewhere, but it’s to the wit of Robin Williams, gifted actor and comic talent and much more, that I turn. Banquets and feasting form a significant part of the Gospel stories and the Eucharist itself, wherein Christ is present to welcome, nourish and change his friends is, we believe, a foretaste of the Heavenly Wedding Banquet of the Lamb and his Bride, the Church. So a dining table is, it seems to me, to be a good place at which to end. Hundreds of people are expected to gather at Newport Cathedral tomorrow (Wednesday) to pay their last respects to one of the most senior clergymen in Wales. Fr Jeremy Winston died just weeks after being installed as Dean of Monmouth and on the day that he was due to start treatment for a brain tumour. He was 57. The Requiem service will be led by the Bishop of Monmouth, Dominic Walker, and will be relayed live to Abergavenny where Fr Jeremy served as vicar of St Mary’s Priory Church for 18 years. The address will be given by the Bishop of Swansea and Brecon, John Davies. The Archbishop of Wales and civil dignitaries are also expected to attend. Cathedral organist Christopher Barton has written a special choral piece for the service calledThe Souls of the Righteous and dedicated to Fr Jeremy. At the end of the service, clergy will line the path as the coffin is carried from the Cathedral. 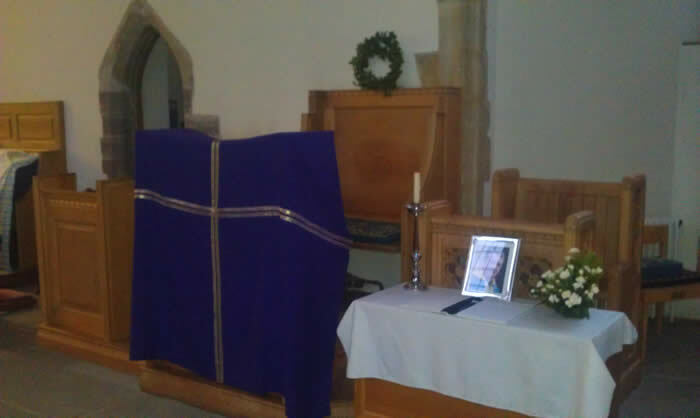 Fr Jeremy’s body will be taken to Abergavenny and will lie in St Mary’s Priory overnight. St Mary’s will be open until early evening on Wednesday to allow people to pay their last respects. There will be a private burial on Thursday. A Service of Thanksgiving for the life of Fr Jeremy will be held at St Mary’s Priory Church, Monk Street, Abergavenny, on January 21 at 11.30am. Fr Jeremy died on November 21. He was installed as Dean of Monmouth in September. The Requiem service at the Cathedral will start at 1pm. Our Advent study course will start at 7pm on Thursday December 8th in the music room at The Priory Centre. 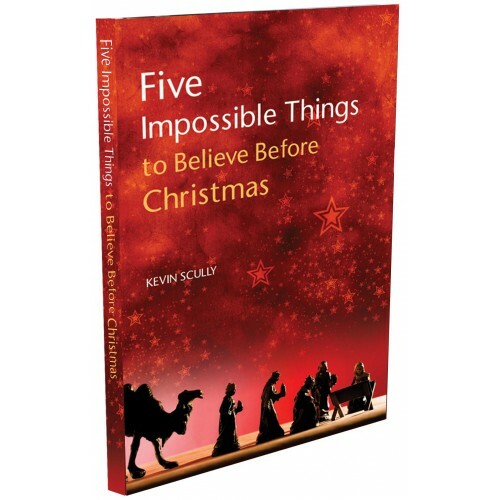 The study is centred around a book by Kevin Scully called Five Impossible things to Believe Before Christmas, which will hopefully enthuse us as we travel through Advent to Christmas. If you would like to purchase the book (£4.99) please speak to Richard in the Tithe Barn. When my wife Karla, the three children and I went to see Father Jeremy last Saturday, we took him a card (and some chocolates, which he promptly handed out to our all-too- eager children). In face of all things Only Thee. My thoughts and prayers go out to the people in Abergavenny and at the cathedral who are all feeling a deep sense of loss of a much loved priest. Fr Jeremy was warm and hospitable and had the good of this town at the heart of his ministry. In a month’s time we shall celebrate the birth of the babe of Bethlehem who came to give us eternal life – I pray our faith in him will keep us strong at this time. In this modern world waiting is something we are not good at doing. Fast meals and instant access are the order of the day. Yet it is sometimes good to wait, as we shall reflect this Advent. For you and me the last months have been a time of patient waiting. Waiting for you to get your new Vicar/Rector in place: and for me to take up this new and challenging role. It is a time when both you and I can reflect on the change that my moving to Abergavenny will have on us. We have not wasted these months of waiting; I have spent time meeting key players, learning about the fabric of St Marys and St Peters, and preparing services for the start of my ministry among you. I have also spent time in prayer and reflection about what God is calling me to do among you, as I move back in to parochial ministry after a time in sector ministry. The ACS Advent Bible study this year looks more closely at this idea of waiting for something that you know God has said will happen and how you spend that time of waiting. The study looks at four biblical characters that had to do just that. Day by day we look at what this meant for, from the Old Testament Abraham &Sarah and Elkanah & Hannah and in the new Zechariah & Elizabeth and of course Mary & Joseph. It is in this waiting on God that God is able to speak to us. I pray, for you, this Advent may not be a busy time of preparing for secular Christmas, but a time of waiting patiently on God in prayer and study of his word. Soon the waiting will be over, and we can celebrate the birth of the Son of God our Saviour. Soon too we can mark my arriving among you. I very much look forward to meeting you all, and to working with you in this corner of God’s Kingdom. May I thank Fr Bernard and the other clergy, along with the wardens for doing such a good job in keeping the show on the road over the past months. The funeral of the Very Reverend Jeremy Winston will take place on Wednesday 30th November at 1pm in Newport Cathedral. Two coaches have been arranged to transport people from Abergavenny to Newport and it is hoped that as many people as possible will be able to attend the Requiem Mass in the Cathedral. If you would like to reserve a seat on the coach, please add your name to the list at the back of the Church. Those who are unable to make it to the Cathedral are encouraged to come to St Mary’s Priory Church. The service will be relayed to the Church and will enable people to listen in silence. If the Church is full, provision will also be made to listen to the service in the Priory Centre as well. A book of condolence has been placed in the Church and will be open between 9am and 5pm each day. Tributes can also be left online by clicking here.